So why the huge call? First, technical analysis. 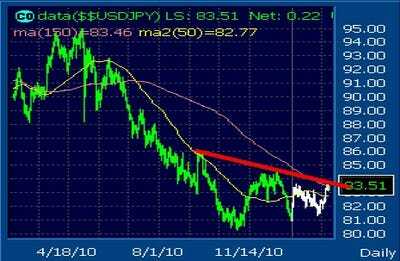 A bottom has been forming in the dollar-yen trade since mid-November. We are long of “commodity” currencies, which in the current world of rising commodity prices is where we should be, whilst we are short of the industrialised nation most seriously hurt by rising commodity prices, Japan. We are now more and more convinced that we shall not see the likes of 80-81 Yen/dollar again in a very, very long while… if ever. Nor shall we see the likes of 79-80 Yen/C$, nor the likes of 72-73 Yen/A$, for the demographics are so terribly skewed against Japan, and the fiscal circumstances are even more so, that we can readily imagine the Yen trading back to “par” in all “dollar” instances. That is, we can readily imagine, over the course of the next several years, the Yen trading “par” vs. the US, the Canadian and the Australian dollars and that we shall do well to position ourselves accordingly.